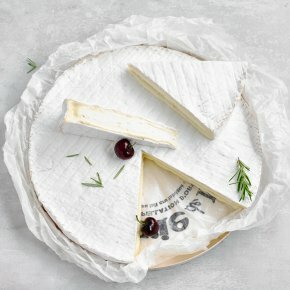 Brie de Meaux has a pungent, rich and creamy taste underlined by flavours of mushroom and truffle. A mould-ripened soft cheese made with unpasteurised cow's milk from local farms. Hand made to the traditional recipe in the Ile-de-France region near Paris by the third generation of the Rouzaire family. Beginning their cheese-making journey back in 1938, Rouzaire is an independent family owned company and is one of only 6 producers currently making Brie de Meaux. Presented in a wooden box to protect the cheese, allowing it to age perfectly. Pairs perfectly with Champagne or red wines from Bordeaux or Bourgogne.